Everybody loves a barbeque, everyone loves a good beer or cider to go with it. Shop for both right here, at Everything But Flowers. We make every effort to have stock available of all items, however in certain circumstances where an item may not be available, Everything But Flowers reserve the right to substitute those products with a replacement item guaranteed to be equal or greater value than the original item.Please be aware some of the packaging may no longer be available and whilst the product may be the same or similar, it may look different to the photograph on our website. For photographic purposes some products have been featured with additional props. These props are not included in the gift boxes. Unless an item is listed, it is not included in the hamper. We are in the process of changing our product photos at present so we urge you to read the substitution policy above and call us if you have any questions or concerns. 1300 30 54 30. 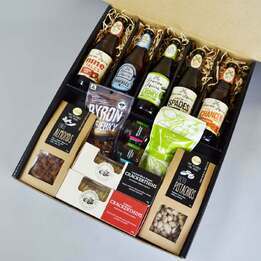 Beer Hampers and BBQ gift sets are top gifts for men, that's why Everything But Flowers have searched far and wide for the best Beer & BBQ Hampers. Check out the range and find something great for your beer loving bloke. When it comes to BBQ, Beer & Cider Gifts, Everything But Flowers has the perfect selection for you. Start grilling those perfect kebabs with the Shish Kebab Grill Set. Tools are known to wear out, even BBQ tools, so you can’t go wrong with our 20 Piece BBQ Tool Set. Finally, the Summer Seafood BBQ Hamper is great to pair with an afternoon of barbequing all manner of seafood. BBQ, Beer & Cider, Everything But Flowers can do it all. Everyone loves good barbeque food along with a beer or cider as a good drink. What makes the barbeque party even better? Excellent barbeque food, superior quality beer and cider! Let us introduce you to our beautifully wrapped hampers that come with delicious food and good drinks! What hampers can I find on the BBQ, Beer & Cider section at Everything But Flowers? At Everything But Flowers, we have several different types of hampers to choose from. And if you’re looking for women’s gifts, men’s gifts, kids’ gifts, we have them all available at Everything But Flowers. For the BBQ, Beer & Cider section, you can find Premium United Nations of Beer Hamper, James Squire Ale Hamper, The United Nations of Beer Hamper, Beers of Australia Hamper, Summer Seafood BBQ Hamper, Premium BBQ Australian Hamper, and ANZAC Ciders Hamper. Looking for men’s gifts? All these hampers would make an ideal gift! All these hampers come with either Beer or Cider with delicious BBQ food. Everything But Flowers has the perfect selection for you. Consider these hampers if you’re looking for men’s gifts! Which hamper should I bring to a barbeque party? A barbeque party needs good beer, cider and awesome barbeque food. You can browse our online catalogue and take a look at our hampers that are suitable for barbeque parties such as Summer Seafood BBQ Hamper and Premium BBQ Australia Hamper. These hampers make wonderful men’s gifts as well. Our Summer Seafood BBQ Hamper contain Elsa’s Story Crisp baked Crackers Rosemary & Olive, Chefs at Work Spanish Infused Bread Dipper, Spice Thai Pilaf with Cumin, Basil & Coconut, NoMU Seafood and Fish Spice Grinder, Seafood Kitchen Salt & Pepper Calamari Mix, AB Black Gold Balsamic Reduction, NoMU Moroccan Rub, Seafood Kitchen Lemon & Herb Bread Crumbs and Verlaque Lemon & Gooseberry Splash. As for the Premium BBQ Australia Hamper, you can find Morgan & Albert’s Premium Nibbles Brewer’s Blend, Thomas Chipman Cracked Pepper Organic Potato Chips, Random Harvest Roasted Capsicum Mustard, Random Harvest Sun Dried Tomato & Cheese Baguette, Morgan & Albert Premium Nibbles BBQ Peanuts, Thomas Chipman Lightly Salted Organic Potato Chips, Random Harvest Spicy Chilli Tomato Chutney, Valley Seed Crisps Fig & Olive, Morgan & Albert’s Premium Nibbles Pistachios, Baylies Epicurean Delights Plain Lavash, Random Harvest Peppercorn Shiraz Mustard, 2012 Pepperjack Shiraz by Saltram of the Barossa and many more treats and gifts included. These hampers are great for barbeque parties! Purchase these hampers today! I’m looking for a hamper who just beers and food. Can I find such hampers at Everything But Flowers? Yes, you can! 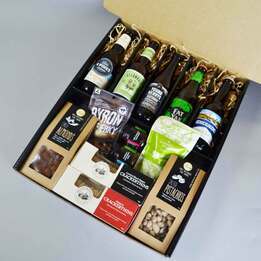 For hamper with just beers and food, you can browse our online catalogue and look for our Premium United Nations of Beer Hamper, The United Nations of Beer Hamper and Beers of Australia Hamper. 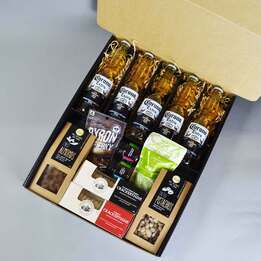 The Premium United Nations of Beer Hamper is presented in a custom-made beer crate. It contains beers such as Menabrea Birra Lager, Bitburger Premium Beer, Hoegaarden White Beer, La Trappe Blond and Chimay White Trappist. It also contains delicious food so you can have some nibbles after having a few sips of beer and chatting with friends. What Are the Best Beer Hampers? 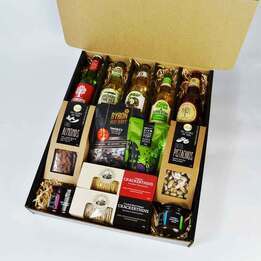 Australians love a nice selection of premium beers, so you can find many beer hampers at Everything but Flowers that could be suitable for your recipient. Of course, certain beer hampers are more popular in our store than others! One of our most popular beer hampers is the Anzac Ciders Hamper, containing some of the best ciders in Australia and New Zealand. So, be sure to check out this option from our catalogue. 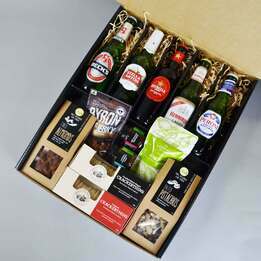 Are There Any Beer and Wine Hampers Available for Special Occasions? Everything but Flowers provides various beer and wine hampers for Aussie recipients. Our beer hampers contain some of the finest Australian craft beers, but also international beers that prove useful for beer collectors and connoisseurs. Of course, you could also consider one of our wine hampers, which contain some of the finest Australian wines from wineries such as Cape Mentelle, Brown Brothers, and Robert Oatley. So, you are bound to find something suitable for the wine collector or wine lover. What Are the Best Beer Hampers in Melbourne? The beer hampers at Everything but Flowers are popular amongst our Melbourne recipients too. Some of our best beer hampers for our Melbourne recipients include beers from breweries such as James Squire and other craft breweries in Australia. So, if only the best beers are good enough for your Melbourne recipient, you are bound to find it in our catalogue with beer hampers. For more information about the rest of the hampers, please log on to our website at www.everythingbutflowers.com.au to find out more.